If you’ve recently been in a car accident, you’re likely going through a lot– pain from the injuries you suffered, confusion about the claims process, uncertainty about the future, and stress about the prospect of medical procedures or missed work. 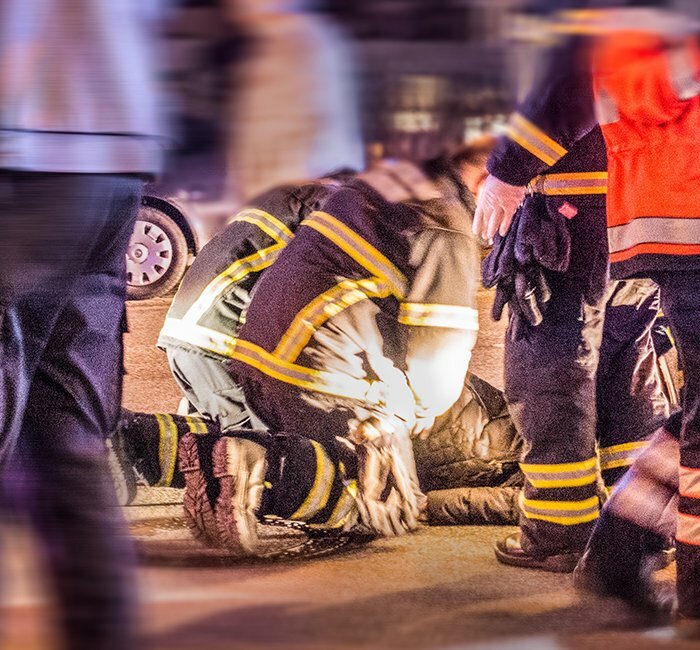 At Frekhtman & Associates, our New York City car accident attorneys are passionate about helping victims of serious and catastrophic car accidents in NYC during this trying time. We provide reassurance and legal counsel to car accident victims throughout the NYC area. We believe in gaining justice for our clients by seeking compensation for medical bills, lost wages, pain and suffering, and other damages they have incurred. Frekhtman & Associates have successfully assisted auto accident victims injured throughout New York City, Manhattan, Bronx, Queens, and Brooklyn in some of New York State’s top verdicts and settlements, including a trial jury verdict that awarded $69,225,000. If you or a loved one has been affected by or injured in a car accident, regardless of whether it was a small fracture or wrongful death, consult with our experienced New York accident attorneys to see how they can help your case. Serious car accidents require professional legal help. Automobile accidents not only involve personal injury law, but insurance law as well. In New York State, it is mandatory to have auto liability coverage, personal injury protection (PIP), and uninsured motorist bodily injury coverage. In the weeks and months that follow a vehicle accident, you’ll be dealing with insurance companies and other third parties who want to pay as little out on your claim as possible. We are intimately acquainted with local law, filing deadlines, and working with insurance companies. Having professional help will ensure that you comply with all regulations, but it also maximizes the chances of getting the compensation you deserve. The New York City car accident attorneys at Frekhtman and Associates have extensive experience in vehicle accident law. They will negotiate with insurance companies aggressively on your behalf and will not settle for less than you deserve. If you attempt to work with another driver’s insurance company on your own, they may use your inexperience to present you with a low-ball offer. The simple act of getting an attorney involved can cause insurance companies to take your claim more seriously. It is also important to contact your insurance company to let them know you have met with a doctor. If you do not disclose this information, they may try to disclaim coverage and refuse to pay for a claim. As one of the largest and busiest cities in the world, New York City streets see thousands of serious car accidents each year- and New York city is busier than ever before. NYC currently has more residents, tourists, and jobs than it had at any other point in history. The city grew by 370,000 residents between 2010 and 2015, and 2015 saw 10 million more tourists than 2010. This means there are a lot of people maneuvering city sidewalks, streets, and subways – and some, like tourists, are not accustomed to the traffic flow or volume of a booming metropolis. About 730,000 vehicles enter Manhattan south of 60th street per day, and residents took over 142 million citywide taxi trips throughout the city in 2015. While subway use has increased in recent years, cars and taxi services remain one of the most popular ways to travel. As of 2015, there were nearly 1.88 million registered household vehicles within city limits and another 72,000 taxi registrations. In 2017, there were 241 motor vehicle fatalities throughout the city and nearly 60,000 injuries. Of these, 122 of those killed and over 11,500 of those injured were pedestrians. The vast majority of car accidents involve human error – in fact, over 36,000 of 48,000 crashes reported throughout the city in 2014 were due to human factors. In a city that has legendary traffic flow issues, it should come as no surprise that a common human contributing factor to crashes is “road rage.” In fact, anger and aggressive driving played a role in 664 car crashes in 2014. Alcohol involvement is also a common contributing factor in area car accidents. Throughout the city in 2014, there were 1,101 accidents leading to injury in which alcohol played a role in the crash. The most common contributing factor in NYC car accidents, at 25%, is distracted driving. While most of us think of distracted driving as cell phone use and texting, the National Highway Traffic and Safety Administration defines it as any activity that takes a driver’s eyes off the road. Examples include applying makeup, eating or drinking, playing with the radio, or even participating in an impassioned conversation with a passenger. In 2014, there were nearly 12,300 crashes attributable to driver distraction. Cell phone use and texting contributed to an additional 101 crashes throughout the city. Other causes of crashes involve failure to adhere to local traffic laws. Some of the most common are following too closely (rear end accidents are among the most common in the city, representing nearly 3% of all incidents). Others include disregarding the flow of traffic, failing to yield, speeding, turning improperly, or unsafe changing. Together, these violations account for nearly 22% of traffic accidents in New York City. Less common, but still prevalent, are accidents that arise from non-human factors. Examples include vehicle and manufacturing defects and environmental factors. Vehicle defects causing accidents include defective brakes (accounting for 1% of all crashes in New York City), steering failure (0.6%), and oversized vehicles (0.6%). Vehicular failures account for around 6% of crashes throughout New York City. A defect in the manufacture or maintenance of a vehicle may also be a contributing factor in an accident. Improperly-maintained commercial vehicles can incur special liability as well. Lastly, environmental factors made up around 7% of all car crashes throughout the city in 2014. Wet pavement is the most common external factor contributing to crashes, responsible for 1,719 incidents in the same year. Other factors include an obstructed or limited view, and inappropriate lane marking. 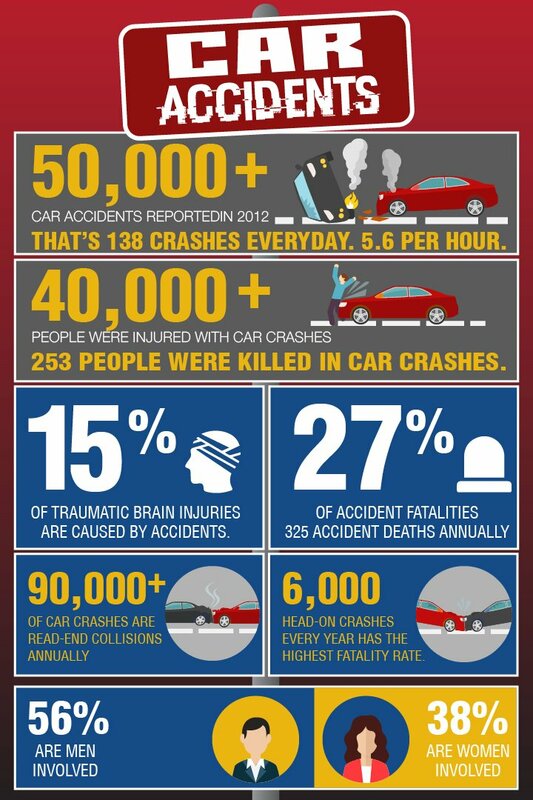 Head injuries are serious car accident injuries that may require extensive medical care. They’re more common in high-speed collisions and may result from drivers striking their heads against the steering wheel, window, or dashboards. The force of the impact can lead to traumatic brain injury, concussion, fractures, vision problems, or hearing loss. Back injuries are another common consequence of car accidents. Spinal cord injuries are serious afflictions that may cause a victim to lose control over their body sensation or movement. These can be seriously incapacitating or disabling injuries that require a lifetime of care and accommodation. Less serious back injuries include herniated discs and soft tissue injuries. One of the most common car accident complaints is a whiplash injury. Sudden movement, such as a head-on or rear-end collision, results in neck and ligament damage. This can lead to pain, swelling, and even temporary vocal cord paralysis. Injuries to the trunk and extremities are equally serious and can cause victims to require extensive long-term care. Blunt force trauma from a car accident can lead to broken ribs and injured or collapsed lungs. If a car accident victim has pre-existing medical conditions, he or she can even go into traumatic cardiac arrest from the crash. In some cases, a person may appear fine from the outside but have internal bleeding that presents a life-threatening emergency. Finally, car accident victims may incur injuries to their legs, hands, feet, or arms. 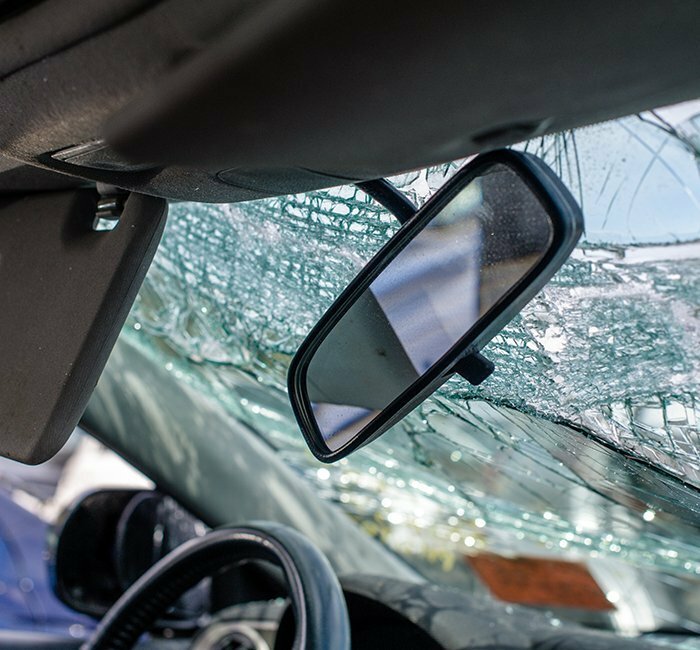 Broken limbs and crush injuries can occur from the force of two cars striking against one another or from the impact of a limb hitting the steering wheel or dashboard. There are few more unwelcome sounds in life than screeching tires followed by the thud of your vehicle hitting another’s. That sound often signals the beginning of what is often a long and frustrating process. Mix together your damaged vehicle, possible injuries, and a stonewalling insurance company, and you have the makings of a nightmare. While you can’t go back and prevent that event from happening, understanding the process can help you make intelligent decisions along the way. New York is one of 12 states to follow a no-fault insurance system. In the event of a car accident, you will look to your insurance policy, not another driver’s, to collect compensation. One of the main benefits of the no-fault system is that you won’t have to prove the other driver was negligent to collect benefits. The claims process is generally easier since you’ll be paying the deductible to your own insurance company and receiving compensation through your personal injury protection (PIP) policy. On the other hand, having no-fault insurance limits your ability to file a personal injury claim against a negligent driver. Special damages, which include medical bills, lost wages, and the cost of any additional follow-up care or rehabilitation. General damages, which address non-material losses such as pain, suffering, or loss in life quality. Typically, the no-fault system does not allow for drivers to collect money for general damages, unless injuries meet one of the criteria above. In rare cases, you may also be able to pursue punitive damages from an at-fault driver. The legal system reserves these kinds of damages for cases of gross negligence or wanton misconduct. The courts award these damages to victims as a punitive measure or to “make an example” of the negligent party. Each state sets their own time limits, or “statute of limitations,” for personal injury cases. New York allows victims of serious car accidents three years from the date of the injury to file a lawsuit against the driver responsible for their injuries. Anything past that date will be dismissed. In New York State, there are also laws that prohibit a person injured in a car accident from recovering any compensation unless they file certain documentation within set deadlines. If you need to apply for no-fault benefits, you must do so within 30 days of the accident. These benefits allow the insurance company to pay for expenses related to your accident regardless of who is at fault. If not submitted on time, the insurance company may deny payments. If you are involved in an accident with a New York City police car, ambulance, fire truck, sanitation truck, or other agency vehicle, you must file a lawsuit within one year and 90 days of the accident date. Additionally, a Notice of Claim must be filed within 90 days of the accident to notify the city or its agencies of the facts and circumstances surrounding your case. The statute of limitations is particularly important because it dictates your ability to collect compensation for negligence. If you wait too long to file a claim, the courts will likely refuse to hear your case, which will cause you to lose your right to compensation – even if you’re experiencing ill effects from someone else’s negligence. For this reason, we recommend that victims of car accidents set up an initial meeting with an attorney as soon as possible. Major car accident cases can take months or even years to settle, so getting the process started as soon as possible is essential. At Frekhtman & Associates, our New York City car accident lawyers seek to help our clients navigate the complicated aspects of New York City car accident laws and regulations. Without adequate representation, the insurance companies will seek ways to invalidate your car accident claim and not help cover expenses related to the accident. Check to see if the other driver or passengers in either vehicle need immediate medical attention. If so, call 911 before doing anything else. Check the extent of the damages to both vehicles. If the vehicles are endangering or seriously impeding traffic and can be moved to a safe area, do so. Otherwise, leave the vehicles where there are until the police arrive. If the damage to the vehicles is over $1,000, all drivers are required to file a Report of Motor Vehicle Accident (Form MV-104) within 10 days of the accident. Failure to file within 10 days can result in a suspended license, so be sure to complete the form. Regardless of how minor an accident may appear on first inspection, it is critically important that you call the police. Many insurance companies will refuse to honor a claim without a police accident report. The police will also be able to better evaluate the need for medical assistance, which can protect both drivers against future medical claims. Nearly everyone has a cellphone with a built-in camera – use this to take pictures of both vehicles and the accident scene as soon as possible after the accident, preferably while both vehicles are still in the same position they where in after the accident. Also, when exchanging personal information with the other driver, take photographs of the other driver’s insurance card and driver’s license. Why simply write this information down when you can have photographic records of both critical documents? This documentation can be critically important if there is any dispute over responsibility for the accident. Talk to anyone nearby who may have witnessed the accident. If they did, get statements from them as well as contact information. This will be very valuable information if your insurance company has any follow-up questions for them. Under no circumstances should you admit any fault in the accident to police or to the other driver. Limit any conversation with the other driver to only that which is necessary to get their personal information, and only give police what is needed to complete the accident report. Also, as harsh as it sounds, you should never apologize to the other driver. This could later be construed as an admission of responsibility for the accident, and could have serious financial and legal repercussions for you. In an ideal world, insurance companies would simply pay for an accident claim, and for any related incidental cost such as medical care or car rentals once legal responsibility has been established by the police. Unfortunately, this is not an ideal world, and insurance companies are more interested in denying claims and protecting their bottom line than in taking care of your needs. For this reason, it is very important that you contact a New York City car accident attorney as soon as possible after an automobile accident. This is equally important whether you caused the accident or the other driver caused it.